The HP ProLiant DL380e Gen8 is a dual socket entry level 2U server that sets the standard for industry performance, flexibility, and leading energy efficient design out of the 8th Generation HP Servers. The HP DL380e Gen8 supports the Intel Xeon E5-2400 and E5-2400 v2 series processors, with options up to 10-Cores with 25MB of cache and processing speeds up to 2.5Ghz. Additionally with memory capacity up to 192GB, the DL380e Gen8 is compatible with DDR3 PC3-10600 1333Mhz and PC3-12800 1600Mhz RAM. Aventis Systems offers the HP ProLiant DL380e Gen8 with 8 LFF 3.5”, 12 LFF 3.5”, 8 SFF 2.5”, or 25 SFF 2.5” SAS, SATA, or SSD hard drives, with a maximum capacity of 96TB of storage for the LFF chassis and 50TB for the SFF chassis. This energy efficient yet high performance server comes standard with a single power supply. However redundant power upgrades are available along with RAID controller and cache, optical drive, NIC, and iLO 4 upgrades. All of these options and the added bonus of high capacity makes the HP ProLiant DL380e Gen8 perfect for a virtualization host, file server, or even a XenApp or SQL database. 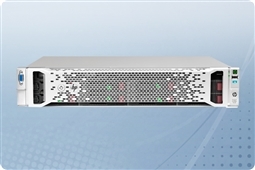 Aventis Systems carries the HP ProLiant DL380e G8 in Aventis Certified Reconditioned condition. All servers from Aventis System include a 3 year Comprehensive Warranty, with eligibility for optional Express warranties and onsite services. So shop below and build your perfect HP ProLiant DL380e Gen8 configuration today! 4TB (8 x 500GB) 7.2K 3Gb/s SATA 3.5"
8TB (8 x 1TB) 7.2K 6Gb/s SATA 3.5"
16TB (8 x 2TB) 7.2K 6Gb/s SATA 3.5"
1.1TB (8 x 146GB) 15K 3Gb/s SAS 3.5"
2.4TB (8 x 300GB) 15K 6Gb/s SAS 3.5"
24TB (8 x 3TB) 7.2K 6Gb/s NL SAS 3.5"